In a world where people do everything from answering emails and collaborating on work projects to getting directions and watching videos on the glowing screens of their smartphones, it can be difficult to believe that there was once a time when phones could only be used for voice calls. With the advances in technology that are now revolutionizing the way people interact with their homes, it probably won’t be long before many people struggle to remember a time when you actually had to be home to unlock your door, set your thermostat, or adjust the lighting. Learning how to set up a smart home might take a little effort, but the possibilities are undeniably exciting. 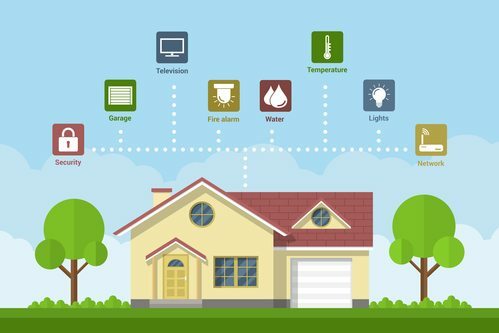 A smart home is a residential or commercial property that utilizes a variety of Internet-connected devices to enable the remote monitoring and management of appliances and systems within the building. In many cases, everything can be controlled with a mobile app and a few taps on the screen of a smartphone or tablet. The idea is to use technology to facilitate both the automation of and communication between the systems people use in their everyday lives. Lighting, security, heating, air conditioning, ventilation, appliances, electronics, and camera systems are just a few of the items appearing on the continually expanding list of things that can potentially be incorporated into a smart home design. Smart homes provide appealing convenience, increased flexibility, improved control, and the promise of more comfort with less effort. Since they are generally designed with efficiency in mind, they also offer an attractive way to reduce energy usage and your energy costs. While the idea of using this technology often seems delightful, the prospect of setting up a smart home can be intimidating. When determining how to set up a smart home, what do you need to do? The best way to determine what might be accomplished is often to look at what those who have already tackled a similar project have managed. Before jumping into the project of setting up a smart home, spend a little time exploring the possibilities offered by current and cutting-edge technology. Browse brochures, read articles, and do some basic research into what can be accomplished in smart homes. Bear in mind that rapid innovation is occurring in this field, so don’t be surprised when exciting, new features and devices suddenly appear and expand the possibilities. After identifying your goals, it’s time to begin crafting a plan to achieve it. Ask yourself what features would help you get the job done. After all, even people with similar goals often have different priorities. If security is your focus, do you want to install a camera system that you can control from your smartphone so that you can keep an eye on your property even when you’re away? Do you feel that fire or frozen pipes are more likely to endanger your property? In that case, you might focus on the ability to monitor and control appliances and your heating system. Are you most intrigued by the promise of improved comfort? You might be drawn to devices that let you come home to a house where the lights are on, dinner is simmering in the crock pot, and your favorite music is playing via the audio system. The selection of devices for smart homes is fantastic. You’ll enjoy many options, but this can make the process of designing and setting up a smart home even more complex. When you need assistance figuring out how to put the pieces together for your smart home, count on Southwest Audio-Visual. We can help with a custom-designed home automation system using Control4 or Crestron. Whether you want to automate a single room or your entire building, our pros will be happy to guide you through the entire process if you want to learn how to set up a smart home. Contact us today to learn more.